My friendship card finally arrived at it's destination. as it took many weeks to arrive. it can be used for many occasions. It is a very useful pattern to have. Threads are Mettler Polysheen 0546 & 5846. The beautiful die cut hearts and butterfly along the top is by Joy! 600/0404. I filled the basket with flowers using Memory Box, Small Hydrangea Blooms. Leaves are Cheery Lyn B178 , I added a little gold along the edge. Pearls, distress ink, butterflies and hobbydots have also been added. I had loads of fun creating this card and I hope that you also like it. This week our son Michael celebrated his birthday. I thought that it would be perfect for him. which is available from Ann's Paper Art webshop. Threads are Mettler Polysheen 0020, 0851, 1514, 2674.
which were coloured with distress ink. 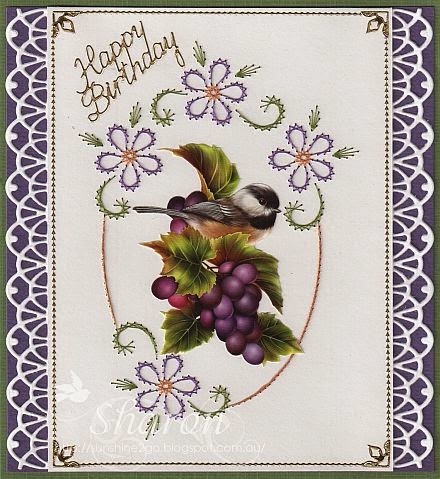 "Happy birthday" stamp and "Country Gent" pattern paper is from Lili of the Valley. The swirled edge is from Spellbinders "Borderabilities" S5-180. thrilled to bits when he opened it. combined with 3D Embroidery Pattern sheet #4 "Morning Glory"
Threads are Mettler Polysheen 0700, 2330, 3840, 5822, 5833. 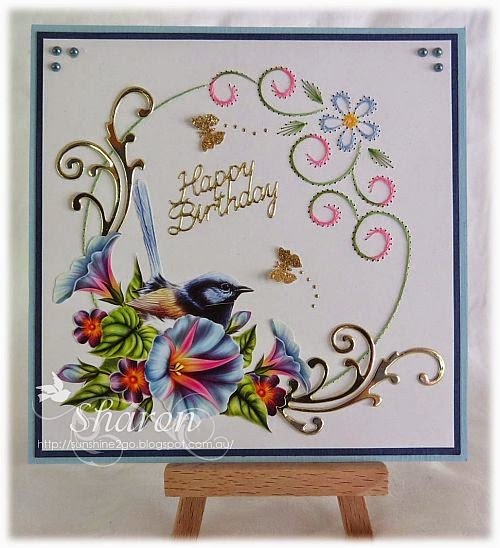 Gold flourishes are from Marianne Design - Frame and Swirls LRO116. Butterflies, stickers, hobbydots and pearls have also been added. Thank-you for coming by and looking at my new creation. a variety of different cards. I have turned the pattern around. Threads are Mettler Polysheen 0842, 2905, 5833.
it can be used for many occasions. 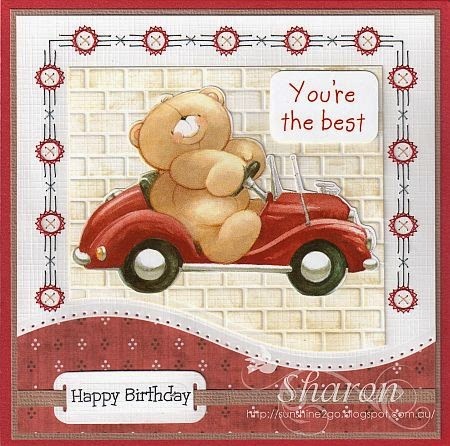 Stickers make a lovely finishing touch to the card. I have stitched a new pattern by Ann's Paper Art which can be found in HJ119 - a2077. Combined with 3D Embroidery Pattern, sheet 16 "Cupcakes"
Threads are Mettler Polysheen 0552, 2905, 3040, 3151. Victorian Square by Couture Creations fitted in the centre of the pattern beautifully. The card stock is from my stash, it is glittered and has lots of swirls. 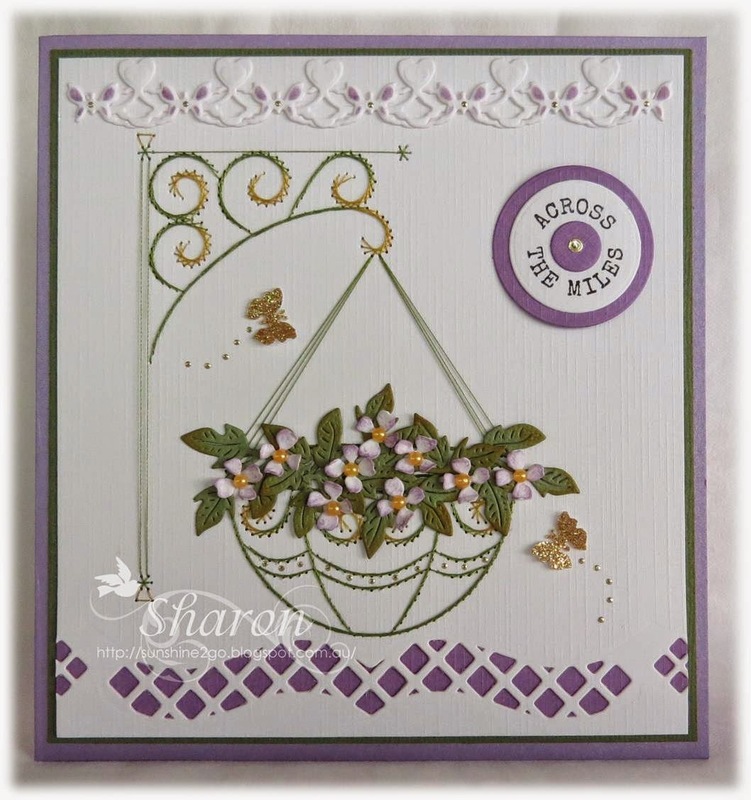 Hobbydots and Findit stickers have been used to add the finishing touches. 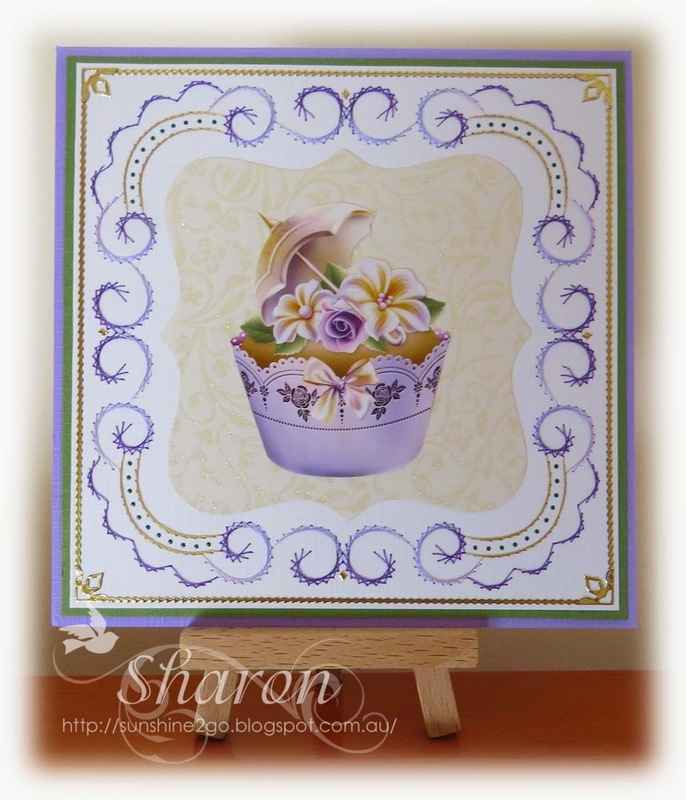 I enjoyed creating this card and look forward to stitching this pattern again. Thank-you for coming by and having a look at my creations.